Part 2: Gimme an R! RECORD STORE TALES Part 2: Gimme an R! When I was growing up in Kitchener, you had only a few choices of who it was OK to listen to. In 1984, your status depended on your listening choices. Quiet Riot and Twisted Sister were both “finished” by that point, if you liked them you were not cool anymore. Kiss were kind of cool, but only if you only liked their newest album. The stuff with makeup was “lame” and “old fashioned”. Van Halen were passé by the time David Lee Roth did “California Girls”. Judas Priest was OK, but the singer had short hair. And Ozzy? He scared us. Even then we couldn’t understand a word he said, plus he looked like a monster on his records. Your only real choices were: Iron Maiden, W.A.S.P., or Helix. And no matter who you were into primarily, everybody liked Helix. Why? Well, mainly because Brian Vollmer lived on Breckenridge Drive. I could probably see his place from my parents’ bedroom window. All the kids who lived on Breckenridge, like Ian Johnson, would always tell stories about Brian, who lived three doors down. Brian’s got a cool car, he’d say. Brian got a Christmas card from W.A.S.P., and it was so fucked up…something about “Slashing through the toes, in a one horse open slay…” But then again, Ian Johnson also told us he knew George Lucas and he a squad of ninjas who had a secret base in his basement. Ian Johnson did not have a basement. So, Helix were the band you had to like. But the stories of Brian Vollmer and his bandmates were considered heresay at best. I had never actually seen Brian in the flesh. He was considered a legend, a myth, like Loch Ness or Sasquatch. Ian, after all, couldn’t be trusted. Well, fast forward two decades, and now Helix is now a rock institution. 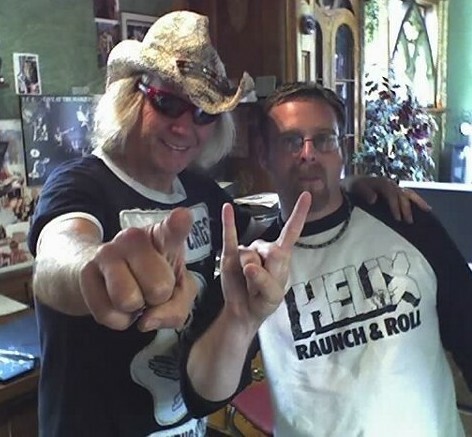 They keep truckin on, with new members and new records, but Brian Vollmer is still at the helm, proudly still asking us to give him an R.
Hell, just last night I was surfing http://www.planethelix.com and saw the very Christmas card from W.A.S.P. “Slashing through the toes”. Brian had scanned it and added it to the memorabilia on his site. Every time you went to the grocery store in 1984 or 85, you’d take a second look at all the long haired guys. I swore I saw Brent Doerner buying soda at Zerhs, but I lost him in the crowd. Or was it Brian Doerner? Again, fast forward a few years. When the movie “Fubar” came out, Sum 41 contributed a version of “Rock You” to the soundtrack. I was working at the record store, and a gentleman came in and asked if he could listen to it. He used to be in Helix, you see, and wanted to hear Sum 41’s version. It was Brian Doerner, Helix’s drummer in the late 70’s and early 80’s. Brent’s twin brother. The Doerners are very distinct looking, I should have recognized him immediately. I of course identified myself as a big fan, and we had a nice chat. Brian Doerner turned out to be the nicest guy. I saw Helix in 1987 and again in 1996, and again from the second row in 2006 (opening for Alice! ), and a bunch of times in 2007. They were great every time. It’s funny because I can’t think of too many kids in the 8th grade who still proudly listen to the same music then as they do now. They’re all probably embarrassed that they used to listen to Mr. Mister, or Boy George. I don’t mind boasting that I was never into the trends. I knew what I liked then, I know what I like now, and although my tastes have grown and expanded tremendously, I never felt embarrassed by my roots. I still love Maiden, I still love Helix, more now than then. I remember when Paul Hackman was killed in 1992. It was the total Cliff Burton accident; he was thrown from the tour bus in a crash. 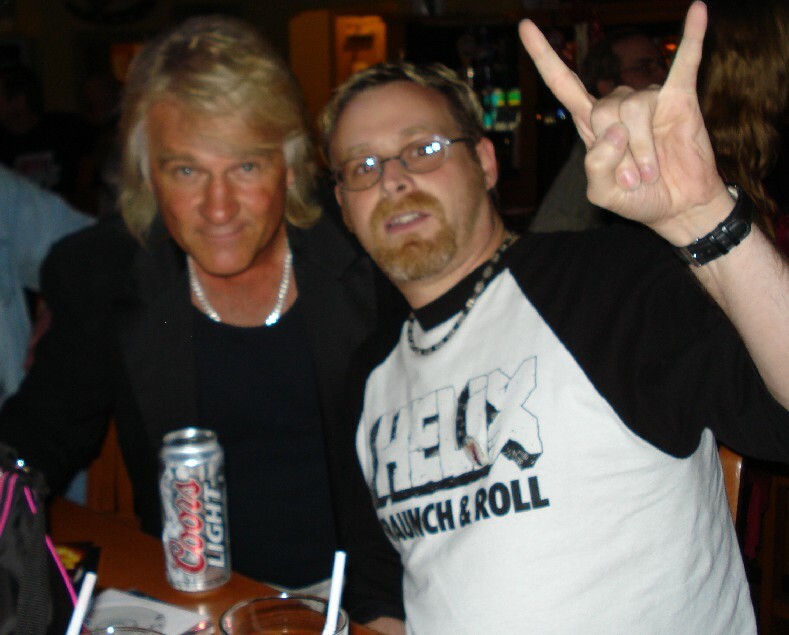 My friend Mike McNeill was in a band opening for Helix at the time, he was there. When we first met in my record store, that’s one of the first topics that came up: Helix! Playing the albums today, you can hear that so many of them are solid all the way through. The first two, Breaking Loose and White Lace & Black Leather have that 70’s sound, as only an indi band in 1978 could sound. I think those albums probably only sold about 2000 copies each at the time. But they are solid, the band was writing varied music. And they were always superb musicians. Brent Doerner’s a really talented guitar player, with an amazing stage presence. When I was in University I tried my hand at bad, bad science fiction short stories. Suffice to say, none of it survives today with good reason. However, Helix had a little moment in my fiction: My spaceship was called an ES-335, named after Billy Oxygen’s ship in the song. And only a little while ago did I learn that ES-335 wasn’t the name of a spaceship at all. An ES-335 was a Gibson guitar. There were other science fiction moments in Helix songs as well. “Wish I Could Be There”, from the same album, is one such song. It’s about a guy who dreams of going to space. That song represents their epic, their “Stairway to Heaven”. “Time for a Change” from the second album spoke of nuclear war, if we do not change our ways, a common theme in the sci-fi of the era. I should clarify, however, that we didn’t even know about these first albums back in 1984. The earliest song we knew was “Heavy Metal Love”, and even that was pretty new. We were vaguely aware that they had existed before 1984, but we didn’t know for sure because there were no music videos before that, and those records were out of print. You couldn’t walk into Sam The Record Man and ask Al King for them. Some nights I sat up in a sweat about this. A country band? Helix? Sure, I didn’t hate country music, my dad played that Johnny Cash stuff and it’s alright. (I even saw Johnny Cash live in ’83, before I ever heard of Helix.) But Helix were rockers! Rockers were about breaking loose! They sang about their heavy metal loves! They told us not to do what people tell you to do, and to always be yourself! If a bunch of country guys were now posing as rockers to make a buck, well, that would be a black mark on Rock N’ Roll. Why? Because it would prove that our dads were right: Rockers were just in it for the money. If we couldn’t trust Helix, you couldn’t trust any of them. Especially W.A.S.P. We didn’t speak of these things often. It was bad to speak of these things. But each of us dreamed—nightmared—about finding a copy of an early Helix album in our uncles’ musty collections. And in the dream, there they were always on the cover. A black and white photo. And they’re wearing cowboy hats. It never came to that. When their first two albums, Breaking Loose and White Lace & Black Leather, were finally issued on CD in 1992, they sounded pretty damn good. It’s classic rock, but harder, much harder. And best of all, it sounds like home. Everything about those two albums sounds like right here. If I played them for you, you’d hear nothing. But to me, I can’t understand how nobody else can hear that these albums were born right here in Kitchener,Ontario. The kids from Kitchener 1984 didn’t hear about Helix until MuchMusic started throwing “Rock You” into heavy rotation. The song was everything we needed at the time. It was catchy, yet you and your tone deaf friends could all chant it. Hey, maybe that’s the same reason hip-hop is popular today? The video for “Rock You” was equally cool. There were whips, chains, nearly naked girls, leather, guitars, and fire. The best part of the video was when Brent Doerner comes out of the water with his Les Paul screaming the guitar solo. And then your friends would debate: “Could that guy really play under water?” “No way man, he’d get electrocuted!” “Are you sure? That looked awesome though.” It was catchy, but you could still be a tough guy if you liked this band, because clearly they got lots of girls. Come to think of it, Helix seemed to get lots of girls. There were girls in every single video that we had seen! Granted, the one in “(Make Me Do) Anything You Want” was doing ballet and stuff, but she was still alright. But then again, Ian Johnson also said that he wrote the Disney movie “Bambi”. Posted in Record Store Tales and tagged billy oxygen, breaking loose, Brent Doerner, brian doerner, brian vollmer, cliff burton, george lucas, greg fritz hinz, heavy metal love, Helix, Iron Maiden, keith "burt" zurbrigg, paul hackman, star wars, w.a.s.p. on March 9, 2012 by mikeladano.